Although I have spent only two days in Kuala Lumpur, it was definitely one of the highlights of my trip in Asia. The modern architecture, tasty food and friendly people made me fall in love with this city. However, my trip wouldn’t have been complete without my stay at the amazing Kuala Lumpur Journal Hotel. Located in the heart of the city, the Journal Hotel is close to the main tourist attractions and shopping areas in Bukit Bintang. For me, one of the main criteria when choosing a hotel is the accessibility from the airport. After a long and tiring flight I want to get as fast as possible to a comfortable bed and take a nap. The good news is that the Kuala Lumpur Journal Hotel is easily accessible by both taxi and public transport and it also has great connections with the rest of the city. Read my one day itinerary to Kuala Lumpur and visit all the tourist attractions in this beautiful city. If you are planning to visit Batu Caves, the hotel also has excellent connection with KL Sentral. Check this article out to find out how to get to the iconic Batu Caves. As you will take the first steps inside the hotel, you will notice the beautiful modern design with simple yet bold lines. You will be greeted with smiling faces and the reception staff will make sure that your stay will be as comfortable as possible. I loved that the check in procedures were fast and efficient. What I liked about our Deluxe King Room was the beautiful design and all the space available for relaxation and work. The room also had a beautiful view over the Bukit Bintang quarter and it was fully equipped with everything you need for a great stay: minibar, TV, air conditioning, complimentary water, electric kettle and alarm clock. If you are looking for a place with good Wi-Fi connection, then the Kuala Lumpur Journal Hotel is the place. As I am constantly connected to my Instagram account and blog, I am always looking for hotels with good internet connection. Overall, our room was really spacious and beautifully decorated and it was equipped will all the necessary amenities. It really felt like home. Are you planning a two-week trip in Malaysia? Check out which places you shouldn’t miss here. Everything was great at Kuala Lumpur Journal Hotel but the bathroom was just amazing. I think this was the biggest bathroom we ever had at a hotel until now. I loved all the space and the big mirrors – perfect for girls! Also, the bathroom had all the essentials needed to spoil myself; exactly what I needed after a long flight. The part of the day I was always looking forward to was the breakfast at Kedai Kopi Journal Hotel. Besides the colorful and modern design of the restaurant, I loved the wide selection of dishes for breakfast. You can order different types of egg dishes or simply head over to the buffet and choose from both local and international food. The Terrace Bar & Grill was the perfect place to enjoy a good coffee in the morning while getting some work done on my blog. If you would like to work indoors, do not hesitate to check out the Workers Union – with an industrial design, it is a nice alternative to the classic working space. The Kuala Lumpur Journal Hotel also has a rooftop pool with an amazing view over the city. Unfortunately, during my visit the pool was closed due to renovations but I am sure it is an awesome place to spend the evening and relax while drinking a Mojito. We had an awesome stay. 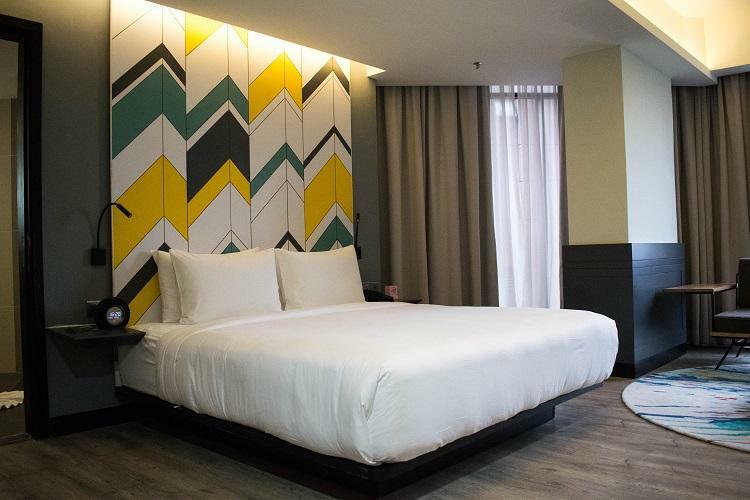 Situated in the heart of Kuala Lumpur, with spacious rooms and great breakfast, the Journal Hotel is a great choice! If you want to book your stay, click here or use the search box below. Disclaimer: I was welcomed at The Kuala Lumpur Journal Hotel as a guest. As always, all opinions are my own and they reflect my true, unbiased experience. This post contains affiliate links, at no extra cost to you.